I have been feeling rather anxious to redecorate lately, not that everything needs to be tossed and started anew, but that I just need a little updating. I have been looking around my house for some things that need tweaking or replacing that will make everything seem fresh again. That was my goal for the summer. Well, summer has come and gone, and I really didn't get to any of those projects. 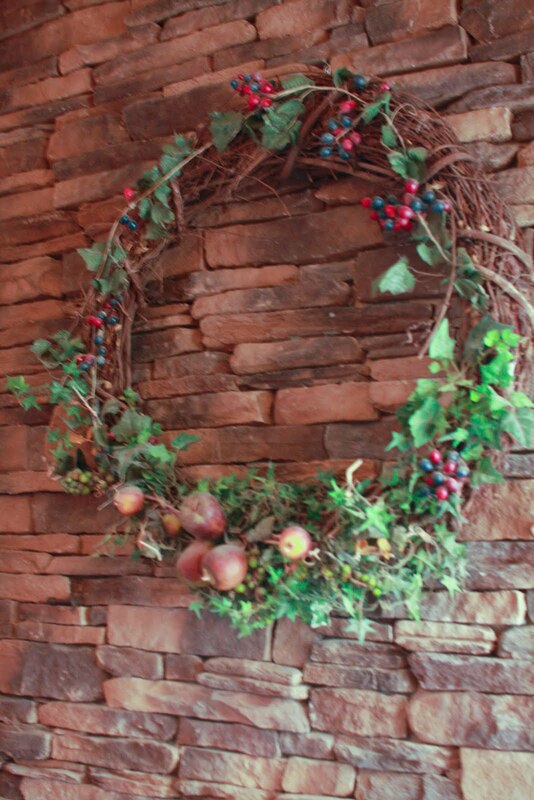 I was feeling pretty bad about that, so I decided, just to make myself feel better, I would at least conquer the one decor element that was looking the most tired - the huge wreath above my family room fireplace. I like it because it is huge and about the only thing I ever found that was the right scale for that massive stone fireplace that has no mantle. I also liked the fruit because the family room is actually attached to the kitchen where I have I have a series of framed botanical fruit prints that I still really like. And of course, when I hung it up 7 years ago when we bought the house, this wreath was much fresher. But now it needed to be replaced. I went to my very favorite home decor store, Tai-Pan Trading (more like a super-duper store!) and looked for something to replace it. 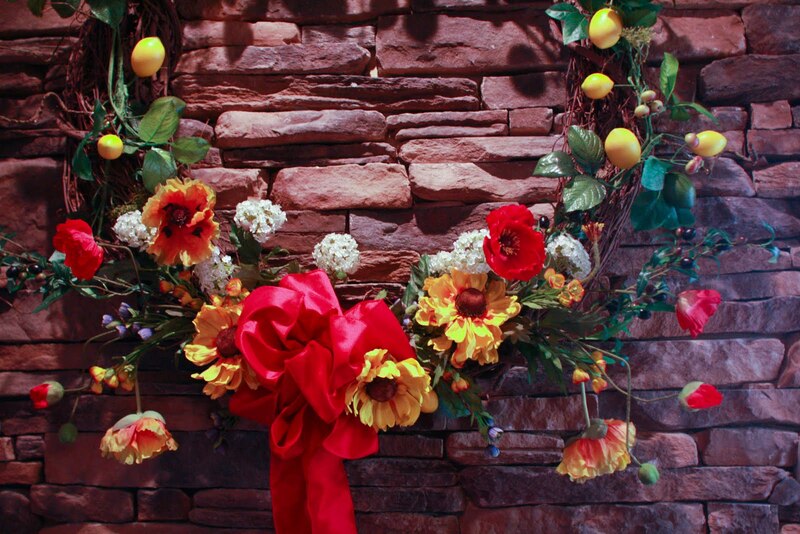 Tai Pan is especially known for their beautiful and realistic artificial flowers, and they have very talented florists on staff who can do some incredible things. I saw a few pieces I really loved, but they were either too small for above my fireplace, or were the wrong colors, or were just too formal. I didn't find anything that was just right. And that is a good thing too, because anything that was big enough was in the $350 to thousand dollar range. Ouch! So I decided to rethink things. 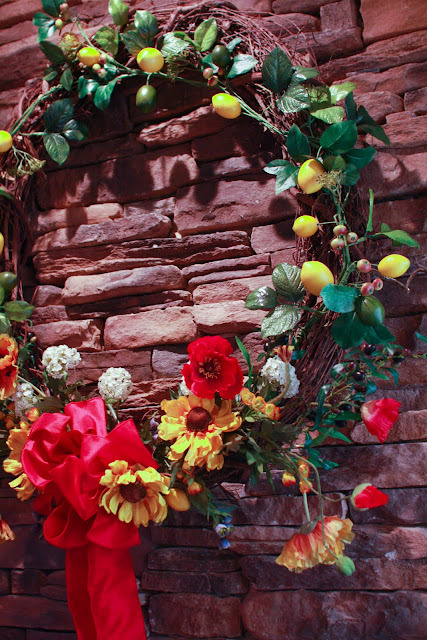 I decided that I could use the wreath that I already had and strip it down and start over with new flowers and fruit. 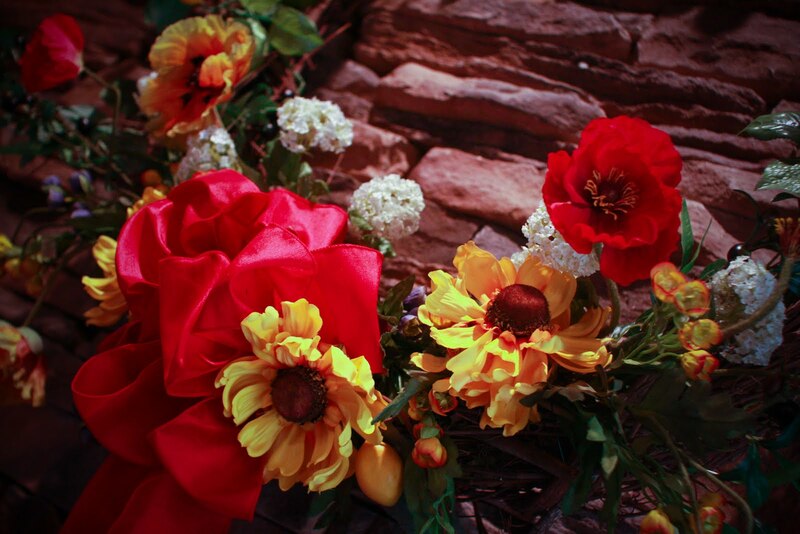 It sounded like a good idea, but the one thing that has ALWAYS intimidated me is floral arranging. 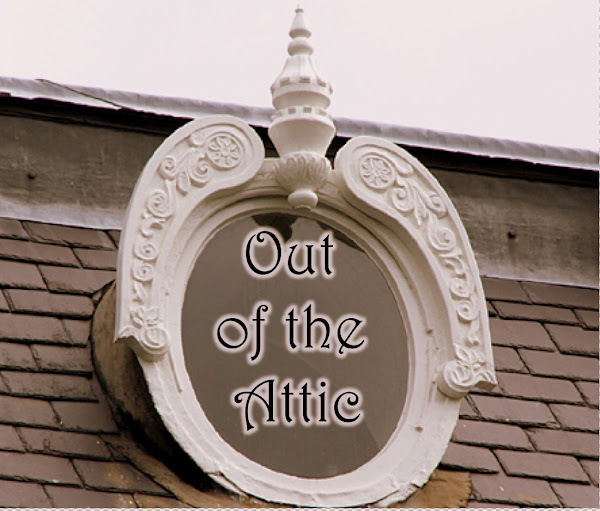 Just ask Attic Gal Alysa. She will tell you that is the one craft I won't do. Well, not unless I am desperate enough, I suppose. So I decided to be brave and go for it. I spent the next 2 hours in Tai Pan picking out flowers and fruit that I thought might work. It was really stressful, because I live 1 1/2 hours away, and they only have a 2 week return policy, so I had better choose correctly, because it wasn't like I could run back for something else. That's why it took me 2 hours. Geez. 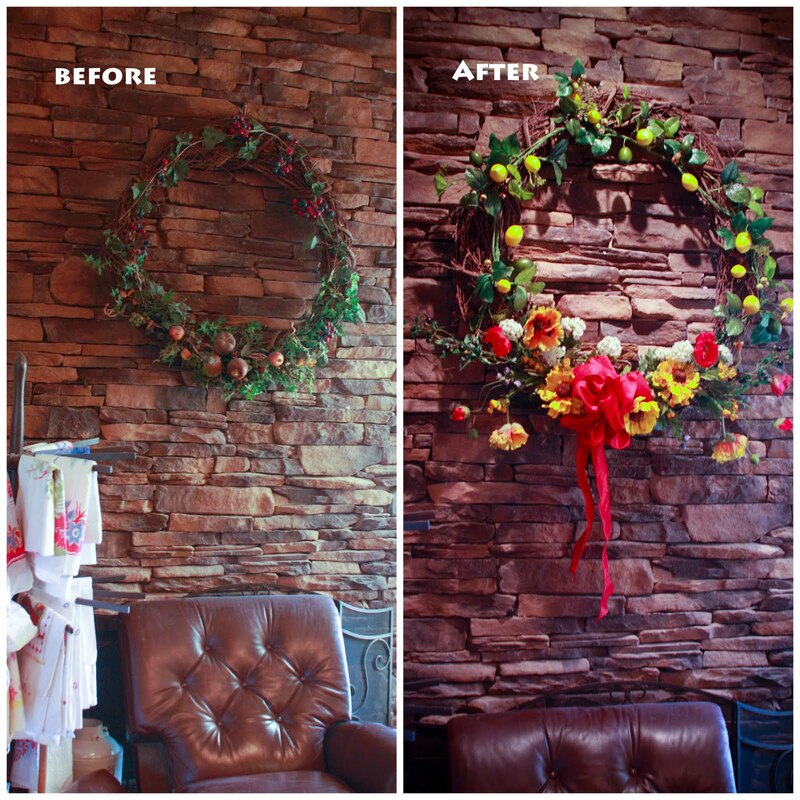 So today I got up the courage to do the big wreath re-do. 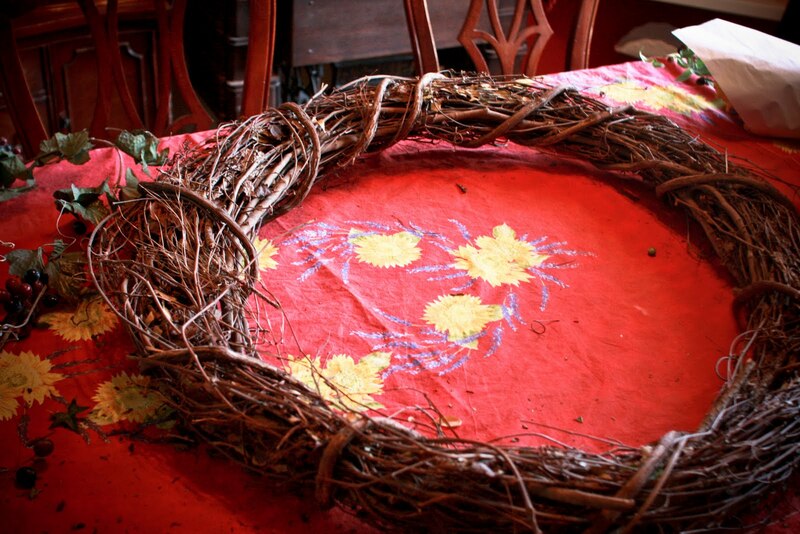 I tore the old grapes and junk off the big grapevine wreath, and started playing around with the stuff I bought. I was sure not to wire or glue anything down until I had it just how I liked it. I actually didn't take very long once I finally got the guts to get started. That hard part was definitely picking the flowers out at the store. I chose lemons and olives to still use the fruit theme, and to go along with the sort of Italian/French feel in my yellow kitchen. And I chose poppies because they seem very informal to me with their furry crooked stems and bright colors, since it is an informal family room. I'm sure anyone with a trained eye for floral arranging would find a million things wrong with it, but who cares? I like it and I think it really brightens up the room! The picture doesn't do it justice. It is big and beautiful and looks pretty terrific in that space. So, for under $100 I was able to re-do an old, worn out wreath rather than spending many times that on a professional arrangement. Cool. The important thing is that I did it. I was brave enough to buy the supplies and try my hand at something I was convinced I could never do. 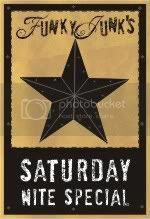 Is there some kind of craft that intimidates you, that you have always thought you couldn't do? I encourage you to rethink that. Try your hand at something new. 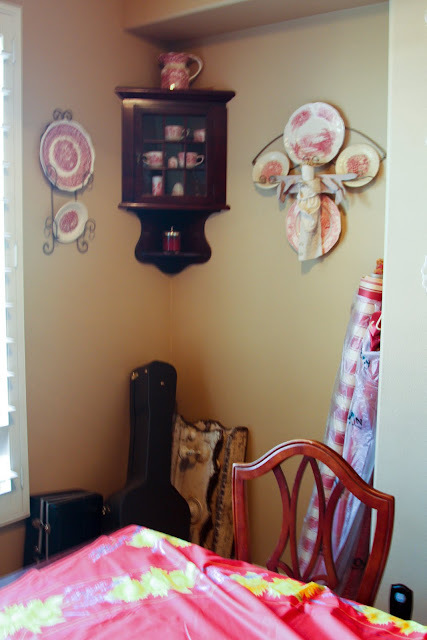 My dining room had this little niche tucked into the corner that was pretty much useless. 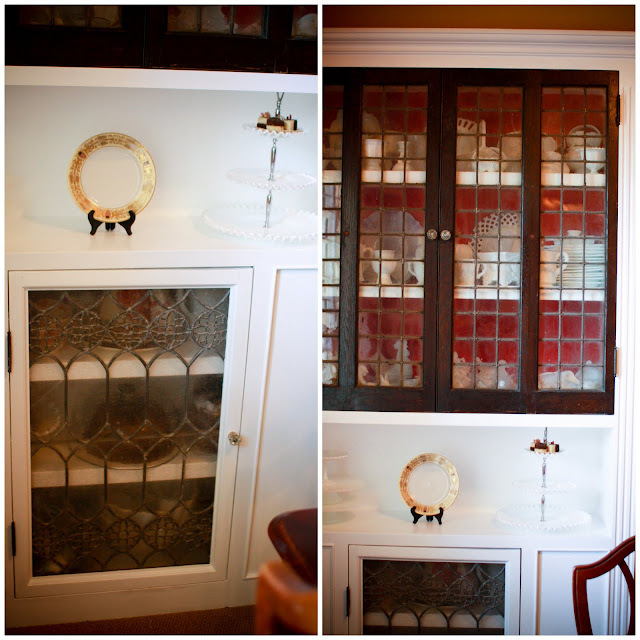 I took some of my treasured old windows to a cabinet maker who built this right into the niche! Now the space is very usable and very, very cool! 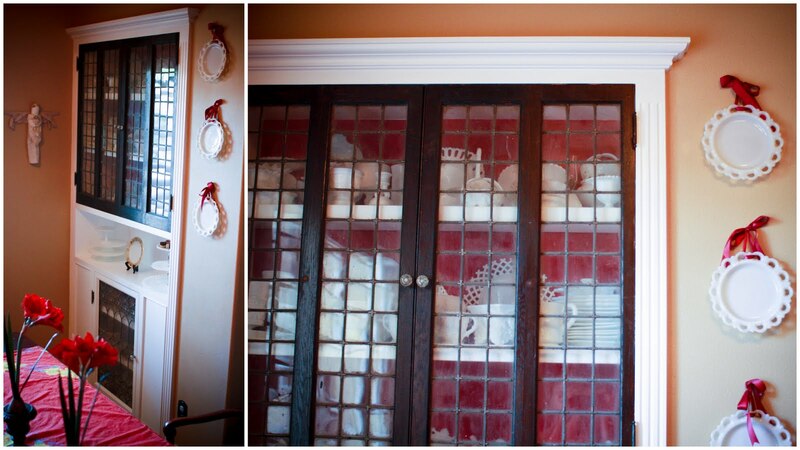 I painted the cabinet white, but left the windows on top the original finish because I loved the patina of the old wood. Then I painted the inside of the cabinet a tomato red to show off my milk glass collection. The bottom door is the window from the first picture on this post. I wasn't so crazy about that wood, so I painted it and added some antique crystal knobs that I also found out saleing. I absolutely LOVE how it came out!!! In another corner of the dining room I had the same cabinet maker build a corner cabinet to display some of my very favorite large milk glass pieces. I carefully painted it white. 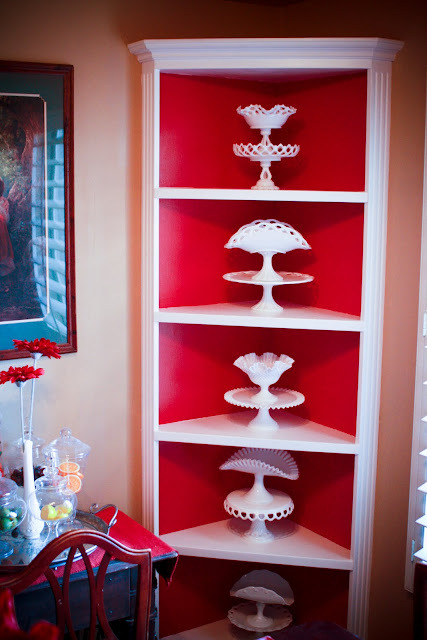 I am so glad I got up the nerve to paint the inside red because it really make my milk glass POP! 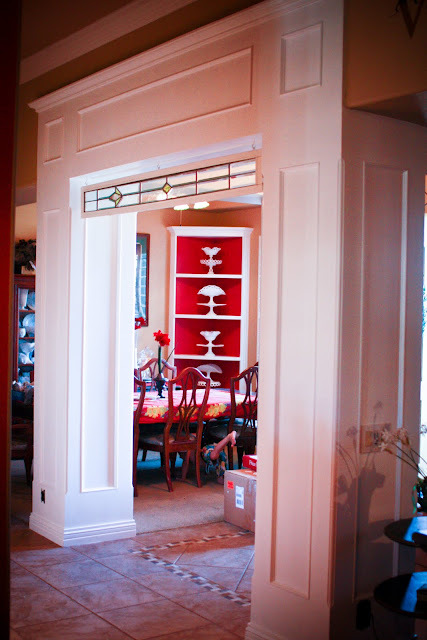 In the entryway, right next to the dining room, we had some wood pillars built and I painted them white. When we bought this house it had no moldings whatsoever - not ever baseboards! The builder told us it was a high-end desert look. Ridiculous. 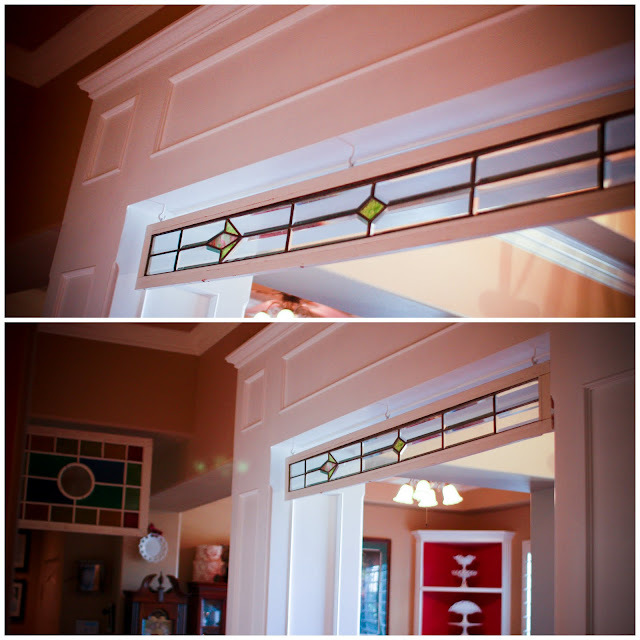 I love moldings and so we have been adding more and more woodwork since we moved in 7 years ago - baseboards, crown molding, bead board, and pillars. I love the look, and this archway is really the crowing piece!!! And of course we integrated another old window into the design! These projects took all summer, but they are finally done, and those windows are now fabulously on display instead of stacked in the garage. Finishing projects like this gives me more motivation to go out and find more cool stuff that I can "someday" do something with because I know that someday will actually come. Now you go out and do a project that you have been thinking about. The rewards will be worth it!